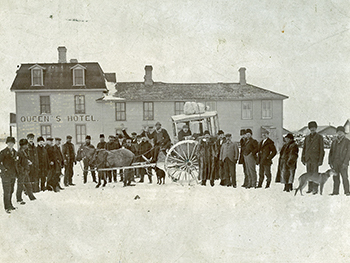 The oldest operating Hotel in the province and considered to be one of the two oldest hotels in the Province, the Queen's Hotel is a Second Empire Revival-style building, of log construction built in 1883. Originally a two storey boarding house, it was used for the Battle River Agricultural Society and Doctor's & Lawyers offices in 1885 to 1886. The building was first used as a hotel in 1889, and a third storey was added in 1890. It became the Presbyterian Church of Canada's original school home for BCI high school students between the years of 1920 to 1932. In 1948 it became the "Queen's Court" rooming house, the name eventually changing to the Queen's Hotel & Lounge, which is now the oldest operating hotel in Saskatchewan. The Queen's Hotel is located at 101 - 25th Street West.